↑ "Hitler's final witness". BBC News. 2002-02-04. สืบค้นเมื่อ 2008-08-10. 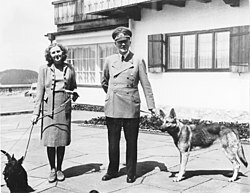 ↑ "cite to use of "Eva Hitler" by Braun in marriage documents". Shoah.dk. 1945-04-29. สืบค้นเมื่อ 2010-10-25. ↑ Beevor, Antony (2002). Berlin - The Downfall 1945. Viking-Penguin Books. p. 342. ↑ Linge (2009), With Hitler to the End: The Memoir of Hitler's Valet, Frontline Books-Skyhorse Publishing, Inc. p. 199. หน้านี้แก้ไขล่าสุดเมื่อวันที่ 28 มกราคม 2562 เวลา 02:56 น.